I am a big fan of Theodore Dreiser and his long, autobiographical novels. My favorite is The Genius, the most explicitly personal, in which he writes about art, talent, genius, and sexual freedom. Published in 1915, the novel did poorly because it was declared ‘publically obscene’. His other novels, particularly The Titan, Sister Carrie, The Financier, and An American Tragedy portray ambitious men and women without a moral anchor. Their successes and failures are beyond good and evil. Sister Carrie, his first novel and the one in which he sets forth his philosophical position, tells of the rise of a poor, working class girl; and the fall of a well-heeled upper class man. Their trajectories have nothing to do with moral failings or strong principle, and are the result of circumstance and conditioning. Dreiser’s supporter and mentor, H.L. Mencken was an admirer of Nietzsche, and shared the philosopher’s works with Dreiser. Dreiser replied that Nietzsche was no more than ‘a warmed-over Schopenhauer’, but the comment was said more out of intellectual rivalry than conviction. Dreiser believed that he, not Nietzsche, was the first to express sentiments of will, amorality, herd mentality, and individual struggle for success. His most famous novel, An American Tragedy, tells the story of Clyde Griffiths who grows up poor, the son of fundamentalist street-corner preachers who force him to sing, preach, and proselytize. Even as a young boy Clyde resents this, senses that he is destined for much more, and begins his independent life of ambition and social ascension. Thanks to a distant family connection he secures work at a rich uncle’s factory. Because he is a Griffiths, albeit from the poor side of the family, he is expected to socialize only with the wealthy members of the community. He quickly learns the manners, mores, and habits of the rich, and is taken for one of them. Like many of Dreiser’s characters, Clyde has strong, uncontrollable sexual urges. He gets involved with a working class girl from the factory floor, gets her pregnant; and murders her. Nothing in his amoral, driven struggle for success can be allowed to stand in his way. Although the guilt-ridden Clyde is no Iago or Richard III, nor a true Nietzschean figure, he represents the drive of unalloyed individual will. Dreiser, like his contemporary Ibsen, understood the struggle of the willful individual within a conservative, herd-driven society. Rosmersholm, Ibsen’s work most like An American Tragedy, tells of a poor woman (Rebekka) who through the force of will and intelligence converts and recruits a wealthy, upper-class gentleman (Rosmer) to her radical progressive cause. Both Rebekka and the newly-committed Rosmer, however, are not the strong, unstoppable forces they once thought they were, and guilt and remorse for past actions cripple them and defuse their efforts. Rebekka, like Clyde, struggles against her modest, simple upbringing. Rosmer unsuccessfully tries to throw off the weight of his long ancestral, aristocratic past. Circumstance, background, accidents of history have disabled both. All three – Rebekka, Rosmer, and Clyde are undone by the past and by conservative moral guilt. Clyde is put to death. Rebekka and Rosmer commit suicide. Clyde is different from Rebekka and Rosmer, however, because he is an American. There is something very American in Clyde and in all of Dreiser’s characters – they are socially ambitious, envious of those classes above them, and are determined to rise above their station. Dreiser wrote in the free-wheeling America of the early Twentieth Century where ambition and climbing the social ladder were celebrated. While Rebekka, Nora, or Hedda Gabler were impressive, dominant women who defied society, their rebellion was unique, surprising, and all the more significant because of the repressive European society at the end of the 19th Century. Dreiser’s Super-men and –women lived in a society which encouraged individual enterprise, risk, and defiance. Clyde’s rise and fall is indeed an American tragedy because he bought the American dream and never realized how difficult it was to achieve. One carries too much baggage to travel lightly and easily through the ranks of American society. 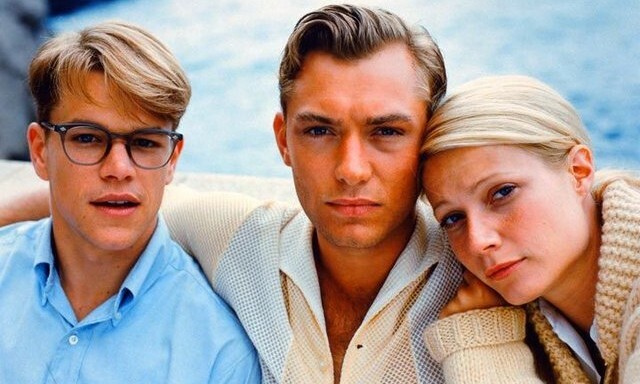 The Talented Mr. Ripley, a book by Patricia Highsmith, adapted for the screen and directed by Anthony Minghella, is a story very similar to An American Tragedy. Tom Ripley, a young man from a poor background (his job at the beginning of the movie is a men’s room attendant at a fancy New York club), by luck and circumstance finds himself in a position to launch himself into high society. He has borrowed the Princeton club jacket of a friend to wear at a music recital at which he accompanies on the piano. A wealthy industrialist notices the jacket, and asks Tom if he knows his son, Dickie Greenleaf, who also went to Princeton. Ripley hesitates only for a moment, then decisively says yes, and is off on his trajectory to Italy, and an invented life of wealth and privilege. He is an imposter just like Clyde Griffiths. He is as amoral, driven, and willful as Clyde or any of Ibsen’s women. He murders without a second thought to assure that he is not discovered in his charade. The movie starts with the voice-over of Tom who says, “I wonder what would have happened if I had not borrowed that Princeton jacket?”, thus echoing Dreiser who believed that luck and circumstance are the only certainties in life’s struggle. One of Woody Allen’s best movies, Match Point, takes up the same theme. A young, ambitious but lower-middle class tennis player has set his sights on the English upper classes, and is single-minded in his pursuit of accession to the world of the rich and powerful. He marries into a wealthy family but like Clyde gets sexually involved with a woman from his own class – an American struggling actress who has her own sights set on social advancement. The woman, like Clyde’s Roberta Alden, gets pregnant; and like Clyde, Chris Wilton murders Nola Rice to eliminate the one obstacle that stands in his way to full acceptance by the nobility. The movie revolves on luck and happenstance. As Wilton disposes of all the ‘stolen’ jewelry taken from the flat of the landlady he has murdered to provide a misleading cover for the police, her gold ring never makes it into the waters of the Thames. It bounces off the railing as Wilton’s throw falls short, is picked up by a drug addict who is blamed for the crime. Wilton is released from suspicion because of this one unlikely, lucky event. One of the last lines of the film is spoken by a London policeman who, commenting on Wilton’s new baby says, “I don’t care how rich he is, as long as he’s lucky”, echoing the blessing of Wilton’s father-in-law. The theme of social ambition is not new. Shakespeare’s Comedies are filled with simple girls marrying dukes and princes. Dickens used social class and struggle as the context for his novels. Pip, the young rising star of Dickens’ Great Expectations is perhaps his best-remembered character. Pip is ambitious, anxious to rise above his social class and through luck (the convict on the marsh) he is able to attain his goals. He becomes disdainful of those he has left behind, embarrassed by them, and anxious to keep a distance from them. In the end the disillusioned Pip comes to his senses, but his life has been tragedy more than triumph. The combination of social ambition, amorality, and Nietzschean will, however, is more unique; and artistic works which explore this conjunction are particularly significant. Nietzsche was right after all in his perception that life is only a venal struggle of the masses and that the only redemption from this purgatory comes from the exercise of will and actions beyond good and evil. Machiavelli many centuries before espoused the same philosophy and influenced Shakespeare who wrote about the endless and meaningless cycles of history. Last but not least, American Tragedy, The Talented Mr. Ripley, Match Point, and Great Expectations are page-turning stories.